Ellen Rosand shows how opera, born of courtly entertainment, took root in the special social and economic environment of seventeenth-century Venice and there developed the stylistic and aesthetic characteristics we recognize as opera today. With ninety-one music examples, most of them complete pieces nowhere else in print, and enlivened by twenty-eight illustrations, this landmark study will be essential for all students of opera, amateur and professional, and for students of European cultural history in general. Because opera was new in the seventeenth century, the composers (most notably Monteverdi and Cavalli), librettists, impresarios, singers, and designers were especially aware of dealing with aesthetic issues as they worked. 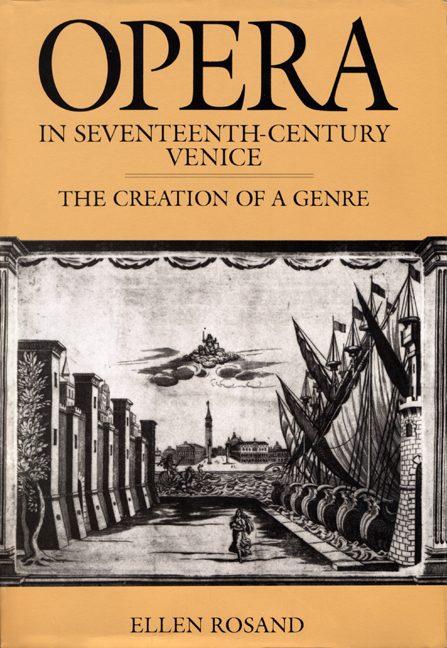 Rosand examines critically for the first time the voluminous literary and musical documentation left by the Venetian makers of opera. She determines how these pioneers viewed their art and explains the mechanics of the proliferation of opera, within only four decades, to stages across Europe. Rosand isolates two features of particular importance to this proliferation: the emergence of conventions—musical, dramatic, practical—that facilitated replication; and the acute self-consciousness of the creators who, in their scores, librettos, letters, and other documents, have left us a running commentary on the origins of a genre.